I took a break from making ice cream and brownies, and decided to make...cookies! What can I say...I'm a creature of habit. When it comes to comfort-baking and eating, you can't beat chocolate chip cookies. Even with temps in the 90's like it was here last week, I can't stop myself from turning on the oven to bake and cook (luckily, these cookies are done in 11 minutes). And I still crave a gooey chocolate chip cookie in the summer as much as I do in the winter. I have a few recipes I make often but it's always fun to find something new to try. This time, I made brown butter chocolate chip cookies - a recipe I adapted slightly from Displaced Housewife. Since I associate brown butter with hazelnuts, and because I personally like nuts in most baked goods, I added toasted chopped hazelnuts to about half my batch of cookies (my fellas usually prefer their cookies without nuts). If you remember, I made Displaced Housewife's olive oil chocolate chip cookie recipe not long ago and they were sensational. I had high hopes for these cookies - which is made with a combination of brown butter and a flavorless oil (I used canola), and a mix of bread and all-purpose flour. They didn't turn out as chewy as the olive oil cookies but these were solid cookies - sturdy and moist, happily devoured by all. I think it's hard to make a "bad" batch of chocolate chip cookies if you make sure to stuff it with enough good chocolate. You pretty much can't go wrong! These cookies start with some brown butter. I made half the original recipe so I started by browning half a stick of unsalted butter. I have to admit that I usually try to push the limit to get the butter as dark as possible without being burnt. However, I was more conservative this time, taking the butter off just as I started to see golden bits form at the bottom of my pan. Brown butter is incredibly fragrant (really does smell like toasted hazelnuts) and in certain uses, the flavor makes a huge impact. 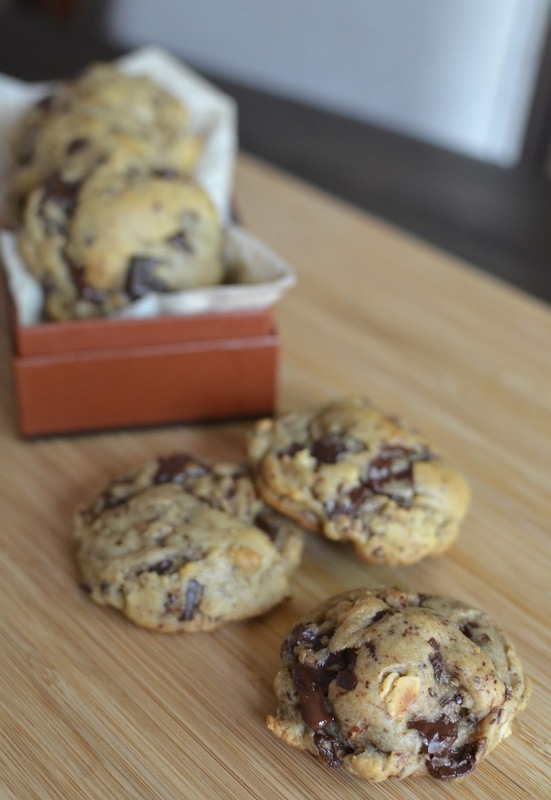 Can you taste the flavor of the brown butter in the final baked chocolate chip cookies here? Personally, I have to be honest and answer, "not really...", but it surely didn't hurt and I have a feeling it made up for the neutrality of the canola oil so maybe there's more of an impact than I'm giving it credit for. These cookies are very easy to make. While you do have to brown the butter, it only takes a few minutes and it eliminates the need to remember to bring it to room temperature before starting the recipe. After the browned butter cools for a bit, stir in the oil, plus the sugars, a spoonful of milk, vanilla, and mix it together with the dry ingredients. Mixing, stirring...it's pure baking therapy! The dough is a bit sticky and tacky, with the melted butter and oil in them, so a little chill time is good. I like to prep chocolate chip cookie dough in advance and store it in the fridge for at least a day for them to firm up and for the flavors and texture to develop. Freeze the scooped cookie dough for a bit before baking if you like thicker, taller baked cookies. My half batch makes about 16 cookies, about 2 tablespoons of dough each. I added chopped toasted hazelnuts to about half the batch so there's something for everyone. You can never have too many chocolate chip cookies. Stow a few away in the freezer for an emergency because freshly-baked homemade chocolate chip cookies soothe the soul and help to make the day a little better! First, brown the butter by placing it in a small saucepan over medium heat. Let butter melt, then continue to cook, gently swirling the pan, until small bits appear at the bottom of the pan. Stay close because this happens fast and you don't want the butter to burn. It will smell fragrant, like toasted hazelnuts, when done. Remove from the heat and pour brown butter into a heatproof bowl to cool slightly. To the brown butter, add the oil, brown sugar, granulated sugar, egg, milk, and vanilla extract. Whisk to thoroughly combine. In another bowl, whisk the bread flour, all-purpose flour, baking powder, baking soda, and salt together. Add the dry ingredients to the wet, stirring with a rubber spatula until combined. Add the chocolate and hazelnuts (if using) and fold in to combine. Transfer the dough to a bowl and cover with plastic wrap. Chill in the refrigerator for at least 30 minutes, or leave overnight and up to a few days. When ready to bake, preheat oven to 375 degrees with a rack positioned in the upper third of the oven. Line baking sheet with parchment paper or a silicon mat. Scoop or roll dough into about 2-tablespoon balls, placing them about 2 inches apart on the baking sheet. For thicker, taller cookies, freeze dough for about 10 minutes before baking. Bake for 11 minutes. Remove baking sheet from the oven and let sit on a wire rack about 5 minutes. Remove the cookies and set on to a wire rack to cool to room temperature (or eat some while warm!). Continue baking remaining cookie dough. I can taste these cookies from Vancouver just by the sound and look of them, Monica. Fabulous! Oh yum... I would totally gobble these up!! Choc chip cookies are never wasted! You have me at brown butter! These cookies sound and look fabulous. These look like gourmet cookies you'd find in a fine bake shop! Perfect any day, any time. I love browned butter in baked good - so much flavor. You're too sweet. I wish I could make them like the pastry shops - the ones that are big, crackly, deep brown, sturdy yet super moist - soft and chew in the center yet with crunchy edges! Can't quite get it at home. Brown butter and chocolate...we could never stop at one. Decadent and delicious! Hope you are doing well and enjoying your summer. That's why it's just 'safer' to make them smaller at home. haha. Yes, summer going by fast. Hope you are having a good one! So glad that you made these chocolate chip hazelnut cookies. Brown butter and chocolate sound like a wonderful combo. I am very sure they taste divine. haha - wish I could share! Hope you're enjoying the summer! These cookies sound and look SO yummy. haha! If I'm the "queen" of anything, it must be queen of finding little things to bake and mess around in the kitchen. We do love a warm choc chip cookie here...sometimes it's the simple things. haha yeahhh it's been SO hot here lately but instead of keeping the oven off (our kitchen gets pretty hot from it due to zero air flow) I just bought myself a fan. lol Now I can keep baking away!! These cookies look just perfect - I wish I had one to enjoy after lunch! We just crank up the AC. ; ) I really can't stop cooking and baking for long when I'm home. Keep enjoying the summer, Ashley. When in doubt, chocolate chip cookies...? That should be a mantra. ; ) Enjoy all your fresh produce and all the sunshine, Cheri. Time for some old-fashioned cookies, Juliana. ; ) Have a great weekend.